(Newser) – Build-A-Bear Workshop's almost-too-good-to-be-true "Pay Your Age" deal turned out to be just that. Or at least just too good. The shopping mall staple, which specializes in customized stuffed animals, offered shoppers a one-day-only deal: customers could buy the typically $20 to $35 items for a price matching their own age. Per Fortune, the promotion, which was offered in the US, UK, and Canada, was pulled after just hours. As USA Today notes, the insanely long lines that appeared outside stores weren't just casual shoppers, they'd all enrolled ahead of time with the Build-a-Bear Bonus Club rewards program in order to get the deal. Some waited hours before they were told the promotion was no longer available. Some of that brilliant upper management mind cr@p is too blame for this. They don't know how to run a business. 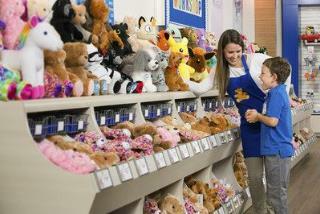 I was thinking about this...and I think there is another lesson for the Build-A-Bear company buried in this debacle. I'm assuming they ran this promotion due to slumping sales...obviously no retailer experiencing runaway popularity is going to "drop their pants" for a day to bring in customers. So they must have been seeing a sales slump and decided to try this to drum up sales. The idea is further supported by the claim that they didn't expect such a huge turnout. But what they got was beyond huge. So what's the lesson? Well if you are a company seeing a sales slump, and you try a promotion to boost sales and you end up with a situation like this...clearly the product you are offering is not what's responsible for the sales slump. Maybe it's the PRICE you are charging for it? Just a thought. I got in. I got my bear. Unfortunately, it cost me $47.